This page is dedicated to the discussion of metadata that would apply for all the paleoclimate archives. For discussion on a specific archive, see the archive working group. The text was moved from the main Working Group page. In answering this question, remember that all the datasets on the wiki are public. 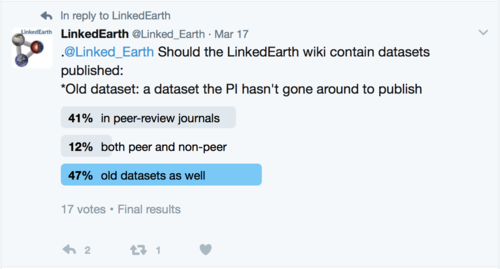 The LinkedEarth team is considering adding a feature where a dataset could be uploaded and kept private until publication, but this feature is not yet available. There were 12 votes since the poll was created on 12:18, 6 October 2016. What type of datasets should be considered "legacy"
There were 6 votes since the poll was created on 14:26, 7 November 2016. This poll was also put on Twitter on November 7 2016. This page was last modified on 25 April 2017, at 12:34.